/ How to Strap Kayak to Roof Rack? Kayaking is a really popular sport that gives you the opportunity to get out on the water in both recreational and competitive ways. 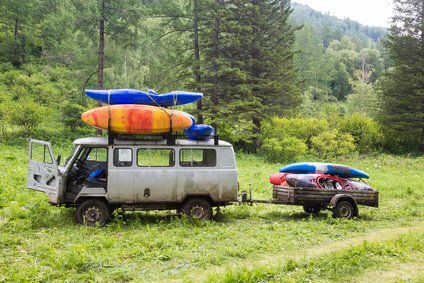 Of course if you have your own boat you’ll need to know how to strap kayak to roof rack so you can use your car to get it to the river or lake in a secure way. In this article we will explore the different options available to you, and the things you must make sure you do to prevent damage. Now it’s time to put your boat onto the rack. Ideally there will be at least two people attempting to do this because you will have a much greater amount of control with the lifting and positioning. If you are on your own, though, it’s still possible, but you’ll have to be careful with lifting the weight and keeping it balanced so you don’t damage your kayak or your car. It’s usually best to put your kayak onto car top kayak racks with the stern facing forwards, and if you are simply planning on tying your boat directly to the rack you will want it to be upside down. This is because sometimes a boats hull can be damaged during transit in a way that will affect its tracking in the water. If, however, you are also using a rack with soft pads or rollers that are designed to protect the boat, you will be able to place it with the hull at the base. Before thinking about strapping the kayak, you will need to ensure that it is placed centrally on the rack, and you should also consider the aerodynamic effect the kayak will be having on your car as you drive. It might actually cause less drag if you turn it around and face it backwards- resulting in better fuel efficiency and less negative effects on the handling. Once you have your kayak in place you are ready to secure it into position. Pull the straps over and around the kayak to meet on the other side. Do not simply throw the straps over, because this will risk damaging the boat or your car. Instead, lift the side of the strap without a buckle and slide it over. If the boat is too big to do this then you will have no choice but to throw it but, again, make sure that you do this with the end that doesn’t have a buckle. Ensure that the straps are not twisted and are lying flat and then feed the end into the buckle and loosely tighten it. Once you have done this with all of the straps you should then tighten each one to ensure a secure hold. At this point you should try to move the kayak, if it stays in place then you have tightened it correctly﻿﻿, if not you will need to try again. You’re almost ready to drive off, but before you do you must tuck away any excess flaps so the straps don’t blow around in the wind as you drive. ​Kayak racks for cars will affect the way that your car handles, so when you first set off you should take it slowly to get an idea how different things will be.